The Book of Lamentations, the sad prophecy of Jeremiah regarding the destruction of the First Temple in Jerusalem and the subsequent exile of our nation, forms the centerpiece of the Tisha B’Av mourning. It is read in public on the eve of Tisha B’Av and then again quietly the following day. Many of the day’s kinot (elegies) are based on this haunting book of the Bible. Much of this book is structured according to the Hebrew alphabet, as if the holy language itself is weeping for the destruction of G‑d’s home and the displacement of His nation. Perfect for following along in synagogue or for studying on your own. 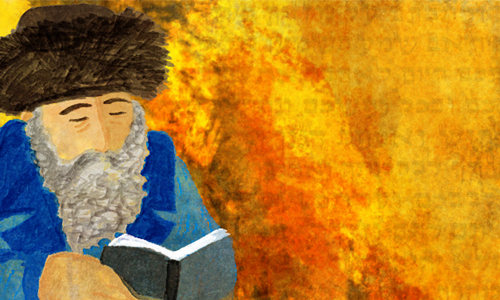 The reading of Eichah in the tune in which it is traditionally chanted on Tisha B’Av. Join Chabad.org’s presenters for classes that examine the text, context, message, and meaning of the Book of Eichah (Lamentations). When Was the Book of Lamentations Written? The common misconception is that the Book of Lamentations, which mourns the destruction of the first Holy Temple and the ensuing exile of the Jewish nation, was written in reaction to those tragic events. The girl behind the counter asked, “How are you today?” but you know that she didn’t really want an answer. Three Jewish prophets opened their hearts to their beloved nation using this mysterious word: Moses, Isaiah, and Jeremiah.